The common mussels off the coast of Sylt are not exactly famous for getting around. But several of them have managed to take a voyage of around 40 million kilometres in the first three months of 2015 – on board the International Space Station ISS. The human immune system is much more complex than that of the mussel – for example, it is able to adapt to changes in environmental conditions such as weightlessness. 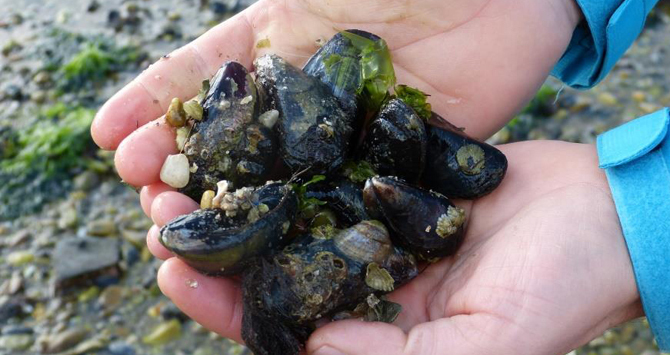 Conversely, the immune system of mussels does not change. This means that the mussel haemocytes are a simpler scientific model. “The issue in the experiment is not so much to draw one-hundred percent conclusions that are relevant to human beings; rather, we aspire to understand the fundamental mechanisms behind the immune system”, Peter-Diedrich Hansen from the TU clarifies. “The mussels had to endure a kind of blood donation and were then put back into the water”, explained biologist Sonja Brungs who works for the Deutsche Luft- und Raumfahrtzentrum (DLR), which supported the TU Berlin in the space experiment. Five test tubes with mussel blood cells from approximately 300 mussels were collected by the scientists. These cells fulfil the task in the mussel organisms of consuming intrusive microorganisms – this is known as phagocytosis, which is a part of the immune defence system. Peter-Diedrich Hansen: “The mussels have only these phagocytising cells – it is thus possible to carry out an unambiguous examination free of extraneous influences”. However, suitable candidates have to fulfil an additional criterion in order to be eligible for experiments on board the ISS: “The mussels’ cells are quite robust – the mussel itself also has to withstand extreme differences in temperature in the ocean”. How exactly the mussels’ defence process reacts to weightlessness is made visible, in the truest sense of the word, by the TU Berlin scientists. In order to destroy intruders, the immune cells produce reactive oxygen. It is possible, in turn, to make this oxygen visible as light particles by using the colouring agent Luminol in combination with a so-called photomultiplier (PMT). The scientists at TU Berlin have developed a measuring system from this. “We measure the light intensity. This provides us with information regarding how strong or weak the immune response proceeds. We can then in turn draw conclusions as to how severely the immune response is impacted by the intruder”, explains Peter Diedrich Hansen, Professor for Ecotoxicology at TU Berlin. On board the ISS the research scientists stimulated the mussel cells with zymosan, a natural product made of yeast. The immune system reacts to this as if it were a yeast infection. In order to be able to execute the experiments in outer space, the mussel cells were frozen at -80 degrees Celsius. They were thus able to make the trip from Germany to the USA where the supply flights for the ISS take off. In January 2015, three of the five test tubes then made the approximately 400-kilometre trip to the ISS – the other two test tubes remained behind on Earth for comparative tests. The space mission test tubes circled our planet at a speed of about 28,000 kilometres per hour – 16 times per day. This then added up to approximately 40 million kilometres of travel over about three months. During the two weeks in which the experiment on board the ISS was running, there was also a lot to do back on Earth. “The control room was occupied 24 hours per day, so that we would have been able to react in the event that, for example, the temperature of the mussel cells would have changed considerably”, remembers Stefanie Franke, whose team controlled the bio-laboratory on board the ISS from the control room of the DLR in Cologne. If there had been, for instance, a change in temperature during cell reconstitution due to technical problems, Franke and her colleagues would have been able to activate another cooling unit, and organised the transfer of the cells by the astronauts into this unit. Communication with the astronaut who executed the experiments in space was also run through Cologne. “With TripleLux-B, we had scientists from TU Berlin on site in the control room. They evaluated the data that we received”, says Stefanie Franke. Thus Peter-Diedrich Hansen and Eckehardt Unruh from TU Berlin, who were the scientists responsible for this experiment, were able to receive information directly from space. The experiments for TripleLux-B were completed in March. Since this time, the scientists at TU Berlin have been assessing the results. They have legitimate reasons to believe that weightlessness does in fact inhibit phagocytosis. This also seems to be the case on the basis of other test results regarding gravitational biology, which had been carried out by Ruth Hemmersbach prior to the flight to the ISS at the DLR. This would mean that the missing gravity would in fact serve as a reason for why the immune system of astronauts in space becomes more lethargic. A test tube with cells from the common mussel was exposed, as a comparative sample, to space radiation on its way to the ISS, and was subsequently stored on the ISS under weightlessness, as were the other test tubes as well. But it was not used for the experiments in space. Back in Cologne, Sonja Brungs received the test tubes, packed in dry ice, for inspection. “It was exciting to know where the cells had been”, she explains. These were mussel cells with an awful lot of flight kilometres behind them.